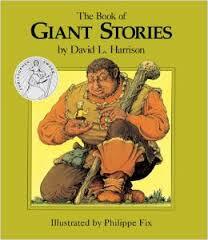 The Giant Who Was Afraid of Butterflies from The Book of Giant Stories by David L. Harrison. When a nasty witch casts a spell on a Giant that makes him see everything around him as twice his size, he flees for cover and despairs about what to do. Luckily, a little boy comes to his rescue with a very clever solution.